Rejuvenating your car interior or any item made with fine quality leather is an easy process. Please carefully read directions before beginning application. Use protective gloves and eyewear. Step 1. Vacuum the surface of the upholstered piece or interior well or use a soft brush to remove large particles of dirt, paying particular attention to seams, folds, and cracks. Step 2. Apply the Rejuvenator Oil liberally (about 4 oz. per seat) with your hands; massaging the oil well into all the surfaces and natural folds of the leather, this puts natural ingredients, not harsh cleaner, back into the leather and forces out dirt. You may also use a soft sea sponge, or a soft paint type brush. One of our Rolls Royce friends, Chuck Hull of Simi Valley, California suggests a spray bottle, which can be purchased at the local home center. Also apply the Rejuvenator Oil liberally nearer the stitched areas as the conditioner will be able to migrate laterally well into the hide. Park the car in the sun with the windows rolled up to create a “steam room” for as long as practical, several hours or a day. In cooler weather, or for long-term storage in a garage, cover the seats with plastic wrap, and “warm” with a hair dryer. Or one of our Ferrari friends, Paul Hammer, suggests covering seats with large plastic garbage bags to be able to sit in the car and move it if necessary. 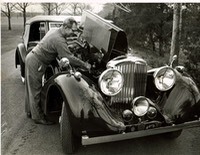 (Allow the oil to be absorbed into the fibrous side of the leather before putting the top down in a convertible.) Direct sun is the worst enemy of any automobile interior or home upholstery. Do not place home or office leather upholstery in direct sun. For “cardboard hard” leather, several applications will be necessary. Patience will be rewarded with good results. Step 3. After the ph correct proteins and collagens from the Rejuvenator Oil have permeated back into the pours and fibers of the leather, strengthening and nourishing them, the surface may be tacky, sticky, gritty, or have a white haze. This is simply the dirt, grime, air pollution, perspiration, salts and other toxins that have floated out of the leather to the surface. Apply Prestine Clean by putting it in a Spray Bottle then wipe off with a SOFT lint free cloth. For tough dirt or vinyl or vinyl tops, brush the cleaner into the grain of the leather or vinyl with a soft bath brush or toothbrush. Let stand for a few minutes, usually by the time you are done with the next piece. Then, after all the dirt has been removed, gently buff to a luxurious finish with a clean, dry, soft cloth. Your car or upholstered leather piece will appreciate the “face lift” and will have the new leather smell restored. 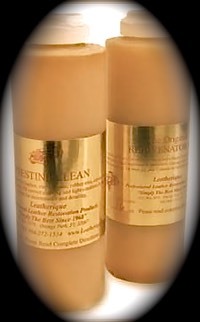 Prestine Clean will not remove the conditioner permeated into the leather. This process may be used on MB Tex vinyl areas to soften and condition. Even flexibility on rubber window trim can be maintained with Prestine Clean. We strongly advise against saddle soap, as it has been known to remove the dye from the leather. Avoid products that contain petroleum or mineral oils, as they cause leather fibers to rot prematurely. If your dye is worn away, call about our simple to use Leatherique Leather Dyes. Our cleaner and conditioner have a capillary action. The proteins, cleaners, and conditioners find their way deep into the pores of the leather and force out the dirt, perspiration, air pollution, unnecessary oils, and other toxins that destroy the fibers of the leather, destroying its strength and flexibility, and causing it to deteriorate. For tough, heavier stains, we do make leather cleaner to remove the stain from the surface of the leather. The remainder of the stain will need to be “floated” out of the leather with Rejuvenator Oil. Badly stained surfaces probably need to be re-dyed. Call, email, or fax your specific Leather care questions to us anytime.